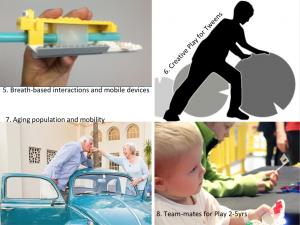 MSc Thesis Projects offered 2018-19 – ixd! These project descriptions are intended as a guide for students at Aalborg University who will begin their MSc thesis projects in September 2018 and completing the thesis in June 2019. Some of the projects require the students to sign non-disclosure agreements (NDAs) to keep some portions of their work secret or delayed release to the public. Please contact Tim Merritt at merritt@cs.aau.dk to set up a consultation meeting to discuss the projects and your interests. Mobile Social Play Experiences. or GlowPhones3.0 – This project involves developing mobile social play experiences that utilize smartphone sensors and actuators in novel ways. Development will be in Android or IOS and will build upon the 2 previous versions of the platform and allows for exploration into new forms of social play. Spatial Augmented Reality & CNC – User interfaces for controlling industrial CNC cutting machines are often difficult to use and are traditionally developed to facilitate large scale production runs of regular cutting jobs. The cutting software is usually provided by a separate 2D interface that does not take into consideration the materials on the cutting platform. Building upon previous projects (VAL, Eye In the Sky, ProjecTables, Condor), this project involves developing a plugin for Rhinoceros3D that extends the user interface for cutting onto the cutting platform using projection. 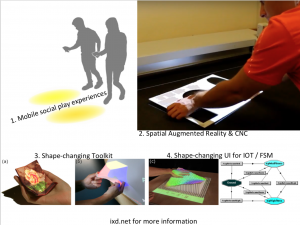 Shape-changing Toolkit – Shape-changing interfaces “change our fundamental approach to interaction design, expanding interactive systems to include our perceptual motor skills to support the same direct interaction our body has with the everyday world. They take advantage of our haptic and kinaesthetic senses, our instinctive perception of physical 3D forms, and provide inherent support for multi-user interaction. ” While there are many examples emerging from research and design labs that show promise, developing tools to enable non-technical designers to design shape-changing interfaces has been identified as an important challenge. This project is deliberately open in terms of technology used, however, interactive prototypes will be developed with the aim of exploring the future goal of a comprehensive toolkit. Shape-changing UI for IOT / FSM – Shape-changing interfaces can support display of information, navigation, and input to large data sets including data from Smart City networks. Displaying the data and inviting interaction can be accomplished with shape-changing surfaces and visual augmented reality techniques (digitally controlled projection on surfaces) to accentuate movements and changes in data. May include 3D Printing, CNC digital cutting, electronics and software development. Breath-based interactions and mobile devices – The silicone sensor developed as part of the ChillFish project can be utilized for various purposes from personal medical devices to new interfaces for musical expression. This project involves development of interactive prototypes utilizing this breath sensor technology. Skills in Unity, BLE, 3D Printing, and Android are helpful, but not required. Creative Play for Tweens – This project aims at encouraging physical and social play for tweens enabled by technology-enhanced toys. Aging population and mobility – This project involves understanding challenges and desires of older people in relation to their mobility. This will lead to developing design concepts and interactive prototypes to illustrate possible solutions to support people in their later years so that they may engage with their family, friends, and society in ways they find meaningful. Project partners include researchers from an automotive company who will provide feedback and critique. 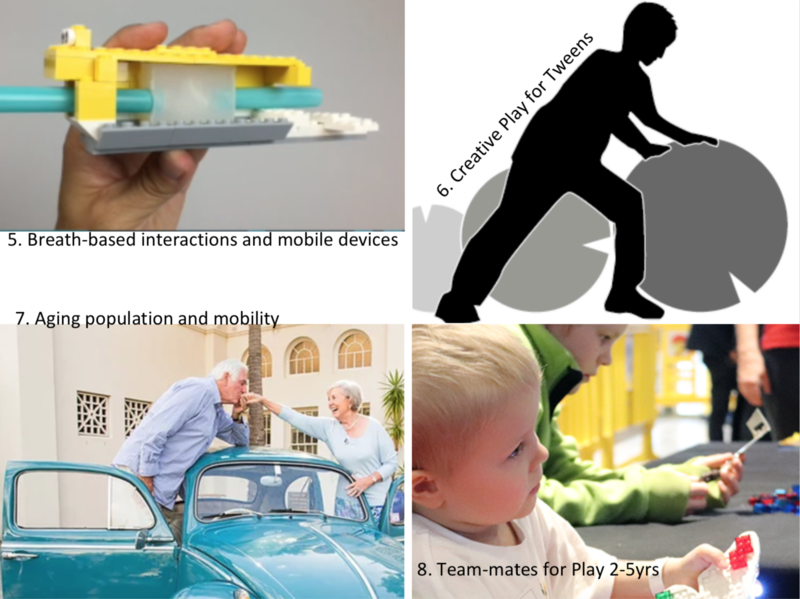 Team-mates for Play 2-5yrs – This project is focused on the design and development of technology team-mates to facilitate play experiences for young children.